Welcome and congratulations on your engagement! 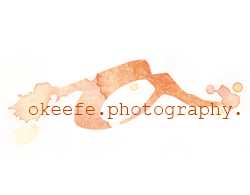 Here at OKeefe Photography, our goal is to help you relive your wedding when you look at your wedding photos. We want you to remember how excited you were when you zipped up your wedding dress. We want you to feel your dad's kiss on your cheek after he walked you down the isle. If we are able to help you experience the day again, we've created a successful image. Because we want you to relive your day, we take a storytellers approach to wedding photography. In other words, we not only get the pretty pictures of your smiling at the camera, but we also take the sweet details that you spent so much time on and the spontaneous moments that make it so special. With over 14+ years of wedding photography experience, we've worked hard on refining our craft. Here are a few examples of our works. Enjoy! Experience Jaime + Adrian's beautiful mountain wedding set among the beautiful pines. Breanna + Logan's wedding is a wonderful example of a unique location + amazing details. We also did a One More Time session! We love weddings! We love meeting amazing couples, designing fun shoots, and capturing a truly amazing moment. We feel incredibly grateful to be a part of the wedding day. We know choosing a wedding photographer can be a bit overwhelming, so we've compiled a few tips to help you get started. 1) Before you choose your wedding photographer, we recommend looking at the online portfolio (AKA their wedding images) and making sure the style and aesthetics match your vision of your wedding photos. 2) Meet or chat with the photographer. Make sure that you enjoy your photographer and can see yourself spending the day with them. This will also give you a good opportunity to make sure they has plenty of experience and the proper equipment. 3) Choose a package that includes two shooting photographers. An experience photographer can shoot most of the wedding alone, but there are a few moments that two photographers are a must, like the ceremony. Two photographers will give you fuller coverage and serval different view points. 4) Choose a photographer with many years of wedding experience. Wedding photography encompasses a lot of different styles of photography: photojournalistic, portrait photography, studio, product (think of the photos of your beautiful rings), kids + family, and much more. We gave a lot of information, but don't worry. We know you are going to find your perfect photographer! If you have any questions, feel free to give us a call or shoot us an email. We're always available for you! Every wedding is special. Check out these images from other amazing weddings we've shot.